Glioblastoma (GBM) is the most prevalent brain tumor and is currently incurable due to failure of surgical and therapeutic eradication leading to an invariable recurrence. The aim of this project is to uncover the epigenomic and transcriptomic aberrations underlying GBM recurrence with a special focus on the alterations of transcription factors and master regulators as key-controllers of gene expression. To address this aim, we will combine transcriptomic (RNAseq), epigenomic (ChIPseq) and nucleosome occupancy check (ATAC-seq) to profile a cohort of matched primary and recurrent samples. 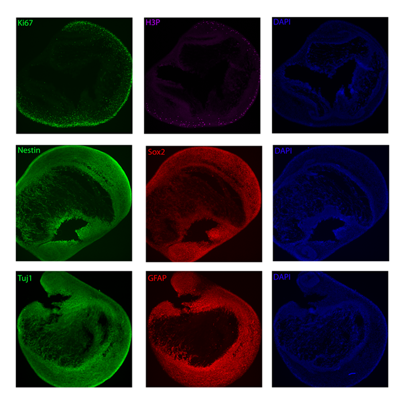 These include not only the derived glioblastoma cell lines, which constitute themselves an unprecedented source of precious information, but their corresponding tissue-counterparts cultured as cerebral organoids. 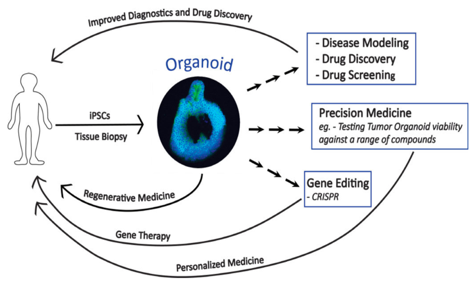 Organoids are organ-like structures that can be formed by 3D cell culture and differentiation of stem cells or organ progenitors, capable of recapitulating aspects of organ function in vitro (A.). In the case of tumors the 3D structure is able to mimic the original tumor architecture, the microenvironmental gradients of nutrients and oxygen, and retain the cellular heterogeneity of parental tumors. This in-vitro ex-vivo model allow the investigation of the interaction between cancer stem cells, proliferative niche and non-stem glioblastoma cell population in order to identify the determinants of cerebral metastases, that are otherwise challenging to perpetuate (B.). We will use this model for medium-throughput drug screening and for the establishment of system for precision medicine studies in order to identify and test new therapeutic target for glioblastoma relapse treatment.